When darkness falls the Las Vegas strip really comes to life, with illuminated displays and dazzling visual effects found on almost every building. On this Night Tour you’ll get spectacular views of extravagant fountains and luxurious hotels, including the Bellagio, MGM Grand and Caesars Palace. Entertaining and experienced English-speaking guides offer an exciting and educational commentary throughout this 3-hour Night tour. They offer a fun and informative way to hear about the casinos, attractions, points of interest and landmarks in Las Vegas. After this you'll see the neon lights of Downtown, where you'll have a brief walking tour and the chance to hop off and enjoy the vibrant Fremont Street Experience. Board the bus at three different times: 7:00pm from Circus Circus, 7:15pm from High Roller or 7:30pm from Excalibur. Please aim to arrive 15-20 minutes prior to departure. 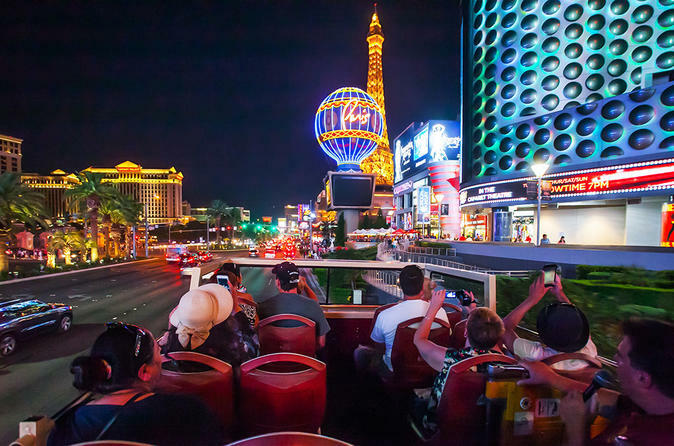 Please note: The night tour is not a hop-on hop-off bus and the walking tour of Freemont Street Experience is included. The bus tour will conclude at one of the original pick-up points.